This banana bread recipe is a family favorite… very moist and flavorful, and it turns out perfect every time. 1. Preheat oven to 350°F. Spray 8x4-inch loaf pan with cooking spray. 2. In a medium bowl, whisk together flour, baking soda and salt. 3. In a separate large bowl, beat sugar and butter with an electric mixer at medium speed until well blended (about 1 minute). Add eggs one at a time, beating well after each addition. Add banana, yogurt, and vanilla; beat until blended. Add flour mixture; beat at low speed just until moist. Don't over-mix. 4. Spoon batter into prepared pan. Bake for 50 to 60 minutes or until a wooden pick inserted in center comes out clean. Cool 15 minutes in pan on a wire rack. Remove from pan and cool completely on wire rack. *If you come up short on mashed banana, add unsweetened applesauce to make up the difference. It will make your bread nice and moist, and it won't add apple flavor to the bread. I have loved this recipe for over a year now! Makes perfect bread every time. I love the healthy ingredients, that it makes for a sweet but non-guilty treat! Your recipe inspired me to make it my own, by tweaking it a bit each time I baked it. I love it so much I have it will be featured on my new blog tomorrow!! Thanks for sharing! just added a cup of fresh big blueberries!!!!marvelous. my adult kids are bring me ripe bananas now because i have given them loaves the last 3 weeks. i just cant seem to eat bananas soft!! I did it today! I change same ingredients, I substitute sunflower oil instead butter, then buttermilk instead yogurt and banana extract instead vanella extract. the result was a very soft ,sponjy and tasty banana bread. we loved it! 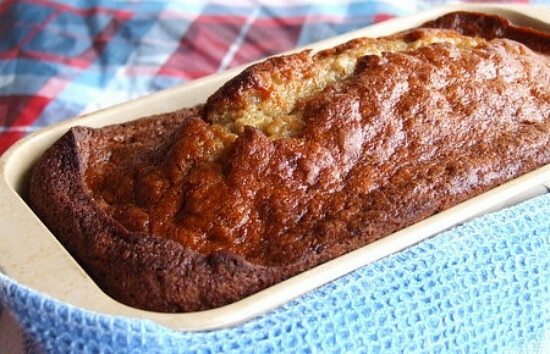 I love banana bread, would it be ok if I added buttermilk instead yogurt? thanks for the nutrition facts! @Mararia, I’m not quite sure… try it and let me know if it’s ok w/ the sub! Did I missed the salt, I didn’t see it on the recipe? It looks great, I’m baking one right now. @Ruth, Yikes! Added salt in the ingred. list. Hope you like it! I added 1/2 cup mini chocolate chips and 1/2 cup chopped pecans! Tastes great!!!! I’m bookmarking this one! Thanks for posting it and the nutrition information….i appreciate that! 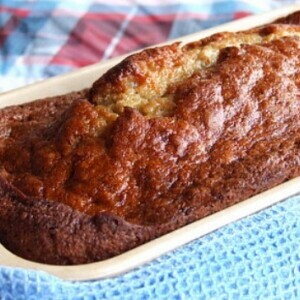 There’s something so comforting about banana bread! I love the photo–it’s gorgeous!